Congratulations on your debut House of Cards post, Em, and welcome to the team! 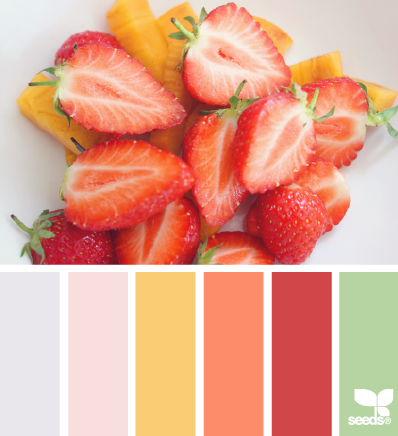 This is a wonderful card - -I can almost taste the fruit! Wecome to the DT Em! Your card is perfect for the inspiration! I was going to use this same set until I saw your card and decided to go with something different! That's what I get for procrastinating LOL! Have a great day! Beautiful card and love the design. Congratulations too. Hi Em! Congratulations on being selected for the House Of Cards DT - your a star! 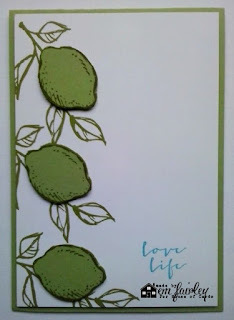 I three, can also almost smell the limes which reminds me of my No1 favourite Summer Dessert - Key Lime Pie! I love the colour pallette cue - fruit salad anyone? A really clean and nice card this. Like it a lot. Love the simplicity!! Welcome to the team! Fabulous card Em! I love all of the limes and your beautiful clean design! Welcome to the team! Beautiful CAS card, Em! Welcome to the team!!! Such a fun card. Welcome to the team! Well done Em - and a wonderful debut card as well! Em, what a nicely made card - love it! Thank you for joining us in the Through The Craft Room Door challenge this week. Love the clean design of your card Em! The limes are great! So glad to have you on the team with us at HOC! HI Em - great to have you on the team! Fun card! Love those green lemons! Welcome to the team Em! Great card and it's GREEN- the most beautiful color in the world! !